Clients of LabelOn™ Modular Self Adhesive Labeling Machines are realising that with the uncertainty of machine set-up removed they can concentrate on other variables that influence machine results. One area that is often overlooked is the consistency of bottles. In this article we concentrate on complex contours. This is where the bottle or product has a curved surface in more than one direction. The label applicator can control the movement of the products and its labels to be applied but it cannot control the shape of the products or label. The first step is to identify the area of the product where the label is expected to be placed. Then, using a business card, hold the edge of your business card vertically against the product. Move the edge over the entire area where the label is expected to be applied. If a gap appears between the edge of the business card and the bottle surface then you have at least one curve, in this case in the vertical direction, on the area to be labelled. Note: A curve in the vertical direction is usually a problem for self-adhesive as it is a curve that is difficult for a label to follow as it is usually dispensed in a direction horizontal to the product; matching the way the bottle product/bottle travels on a product conveyor. While a flat label can “wrap” in the direction of one curve on a product’s surface, it cannot wrap in more than one direction. Taking the business card used before, and holding it horizontally against the surface you now look for gaps between the card’s edge and the product surface in the same area you found gaps when the card was vertically orientated. Note: Curves in a Horizontal direction alone are quote common – round bottles being an obvious case but also oval cross section bottles such as shampoo bottles or detergent bottles. If you do find a business card can show gaps in both a Horizontal and vertical orientation then that area of the bottle cannot be labelled with a self-adhesive label without bubbles or creases. To see some examples of complex contour mistakes in , you can visit a supermarket and look for products labelled with creases or bubbles. Most of the time it will be because of a mistake in the bottle/label design where the label is expected to go over a complex contour. Another test to convince yourself of the problem of over complex contours is to take a sheet of paper and see what happens when you try to wrap the sheet of paper onto a ball. You will always get creases for the paper to be pressed against the ball. For Round bottles and products there is a very quick check to see if complex contours exist. Take two round products and put them beside one another with their edged touching. See if you can see any gap between the touching edges. Now rotate the bottles while they still touch and see if you see gaps appear and disappear. Gaps suggest complex contours and the likelihood of creasing in these areas if labelled. In this case the complex contours are not designed but more a result of the bottle quality and variations. Other sources of complex contours for label applicators can be with very thin walled flat sided bottles. Here the thin walls of the bottles can lead to surface irregularities before and after filling. Depending on where the label applicator is placed it can be a good idea to label thin wall bottles while they are empty; especially if they are hot filled. Hot Foil Coding is a very simple and effective way to get a batch code or a use by date onto your product via its label. It is a clean, no messy inks or solvents, solution where what you see is what you get. Put simply the labels on the machine pass through a gap between a heated type set holder and a backing pad. Just in front of the heated type set is an ink ribbon a little bit like what you might see in old printers or typewriters. The heated type set is placed on the end of a short stroke pneumatic cylinder. At the end of a label feed the controls of the LabelOn™ give a signal to the pneumatic cylinder of the hot foil coder to stamp onto the Label. Placement of the stamp is adjusted mechanically by screwing the stamp to the desired height and horizontal position on the stationary label. Controls on the labeller let you set how long the pneumatic stamp stays out, and a separate temperature controller lets you set the temperature for the heated type. Changing the stamp is a simple matter of changing the brass type letters. Earlier, we delivered a machine system comprising a Side Labeler for very small labels and a Top and Bottom labeler. The side labeler was placed in-line with the top and bottom labeler. The top and bottom labeller had two stations to label from the top and one station to label from the bottom. 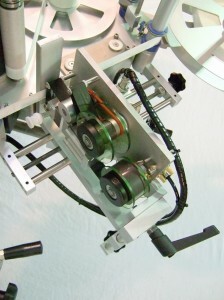 A pneumatic magazine style feeder was attached to the side labeler for Automated Product Feeding. This system was designed to place up to four (4) labels onto Video Games and DVDs. The client, one of Australia’s largest video game retailers, needed a solution to help them place local data and ratings labels onto imported video games. By purchasing video games from large overseas suppliers, the client is able to take advantage of high volume pricing from their supplier; This is because our client no longer needs their supplier to make smaller special label production runs for them. 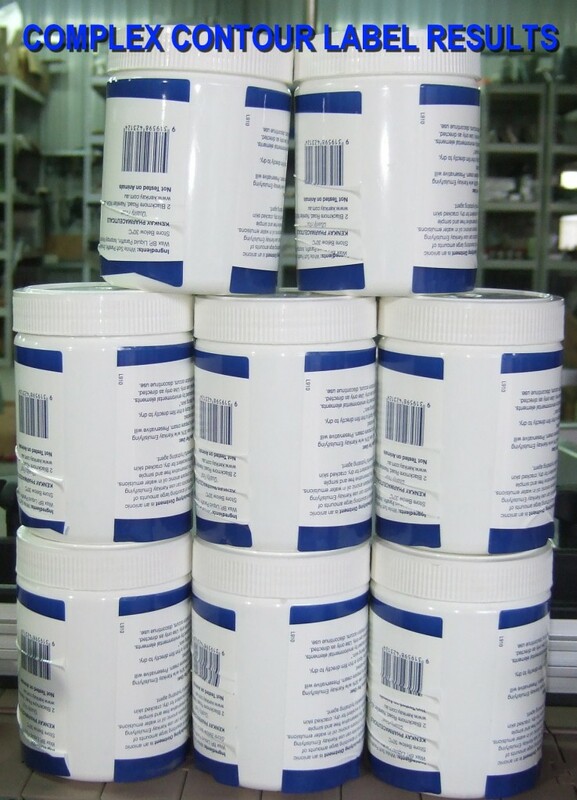 Instead, our client is now able to quickly “over-label” overseas stock with labels that comply with local regulations. Our client calculated the return on investment based on time and labour savings for the LabelOn™ machinery investment would be under 6 months!! This intelligent feature is part of the LabelOn™ technology that insures labels start and stop on the label station in the same place every time. The intelligent function measures the length of the label. Where many older machines simply look for a gap between labels and then stop feeding a label, the LabelOn™ machine both looks for the label gap and “knows” what it is looking for. The standard LabelOn™ Gap Sensor is auto adjusting. This means it can automatically understand when it is looking at a label or when it is looking at the gap between labels. On the side station of this client’s machine, we needed to supply a custom gap sensor to deal with labels as small as 10 mm X 10 mm. The sensor we used had an auto teach function and this was the second feature that needed to be explained to the client. 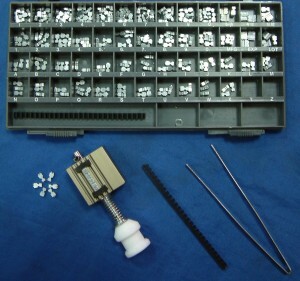 The client production runs vary from 500 pieces to 20,000 pieces each time. 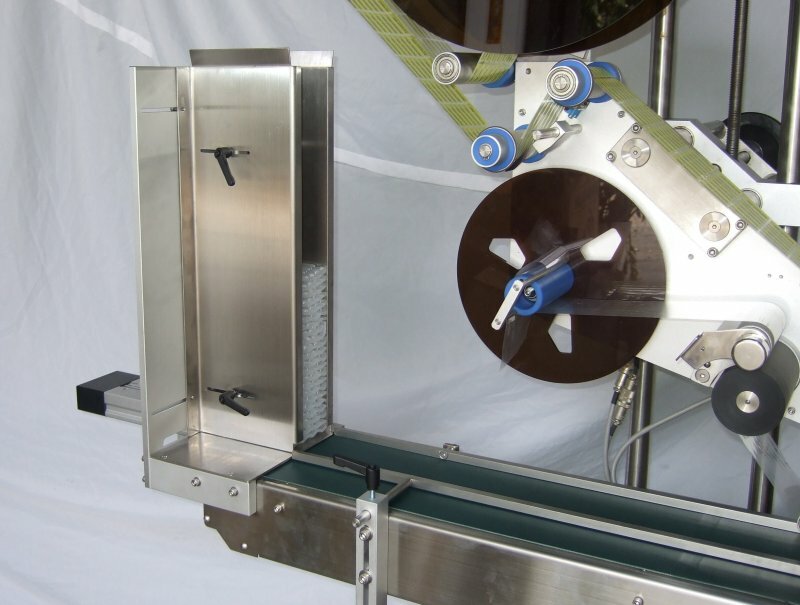 The LabelOn™ machine is designed for easy and fast product changes. Most people would think setting up four label heads and a magazine feeder to label only 500 pieces could not be worthwhile. After only a few hours of running their new equipment this LabelOn™ client understood that it was both easy and worthwhile to change the machine over for their smallest production runs. This installation, like our last machine installations, ticked all the boxes. With the varying regulations for goods retailed within different regions of the world importers often face the challenge of re or over products. Alternatively the importer will face the high costs of low volume custom artwork supply pricing from their overseas suppliers. A major video games distributor approached us with the task of applying small labels onto video game covers. That company needed to comply with unique game ratings requirements and barcode requirements. In order to comply there needed to be up to four different labels placed onto their imported products. The label applicators had to apply small labels more consistently than their manual operations and help reduce the labour costs involved, while speeding up the throughput. Labeling machine accuracy was important and ease of machine set-up was paramount. The proposal given involved a magazine feed operation where video games were loaded into a chute and fed onto a machine conveyor. From there the video games would labelled from the top, the bottom and from the side (along a spine). As the placement of labels by the labeling machine would involve small labels covering existing sections of the artwork, product control and label feed accuracy were very important. Working with phone calls, emails, Skype sessions, CAD drawings, example videos and samples the project was finalised; without face to face meetings. LabelOn™ design and electronic records makes project evaluation via modern communication a reality. It does not matter if you are next door or across the world a LabelOn™ label applicator configuration is easily tailored with real details. We do not need to use slick salesmen; if we get to deal with the Manager or an Engineer then we are confident our machine discussions and proposal will enable a confident and best value proposition decision for your company. Importer label applicators are often provided as a top and bottom configuration because the imported items are often boxed. Importers of goods in boxes may need to over label Cereals, Biscuits, Pharmaceuticals or Cosmetics. These importers can all benefit by using self-adhesive machines and obtaining volume pricing from overseas distributors. Should you install LabelOn™ machines there will be a number of benefits that should become self-evident within days. Every Physical Module adjustment and even the Rail adjustments have a rule or scale for recording.